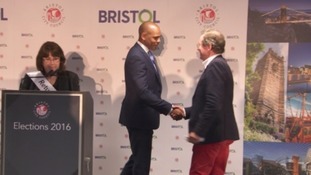 The new mayor of Bristol will be sworn in later. Labour's Marvin Rees beat George Ferguson by nearly 30,000 votes in the local election. His victory, together with his party taking overall control in the council chamber, means that Labour have now have a tight grip on running the city. Thanks to all those who've tweeted and messaged me congrats. It's been incredible to have all your support and excitement. Following his win over the weekend, leader Jeremy Corbyn visited Bristol to congratulate him and to lend support. The Labour leader said his "heart was singing" as he congratulated the newly-elected mayor.